Want to be hired by Marguerite? 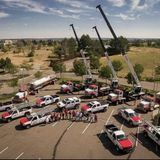 Field service mechanic needed to service company owned semi trucks and hydraulic cranes. All work will be done in the field for the next 6 to 8 months. Paid weekly, salary $80,000. MUST have experience repairing semi trucks, brakes, engine repair, lifts. Please call 720-297-.... Hiring immediately!